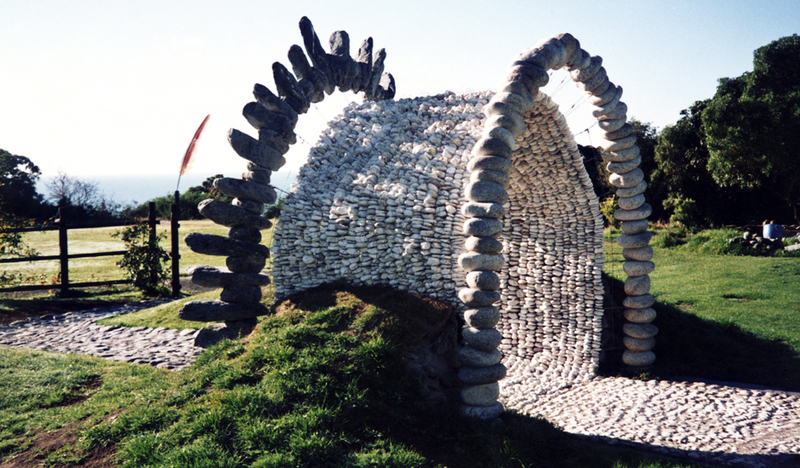 Cave, entranceway to the Kāti Kuri marae at Kaikōura, comprises 5000 white limestone pebbles, collected with community assistance from the coast and woven into a helix. Built around a wooden former then erected into position by crane, the ‘skin’ of pebbles is attached to the stone arcs at each end. Many important events have taken place at this marae, including the final signing of land settlements between representatives of Ngāi Tahu and the government after 200 years of grievances and injustices since colonisation. The late Upoko, Wiremu Solomon and his wife Reo led the revitalisation of the marae and its buildings for the community. He also led the establishment of the now famous Whalewatch tourist venture, which ploughs funds back into the community. Upoko, Wiremu Solomon invited me to create Cave, he assisted me with the making of it, he opened it up, he blessed it with karakia and sprinkled water, he welcomed thousands of visitors to enter the Marae through it, then, with great sadness he was carried out through it for the last time in 2001.